Built in the 1970s, the shopping mall WEZ – Das weststeirische Einkaufszentrum in Bärnbach near Graz is an example of the first generation of malls in Austria. Over the course of the years, the property has become dilapidated and has not been particularly inviting. Demolition has been a serious option. 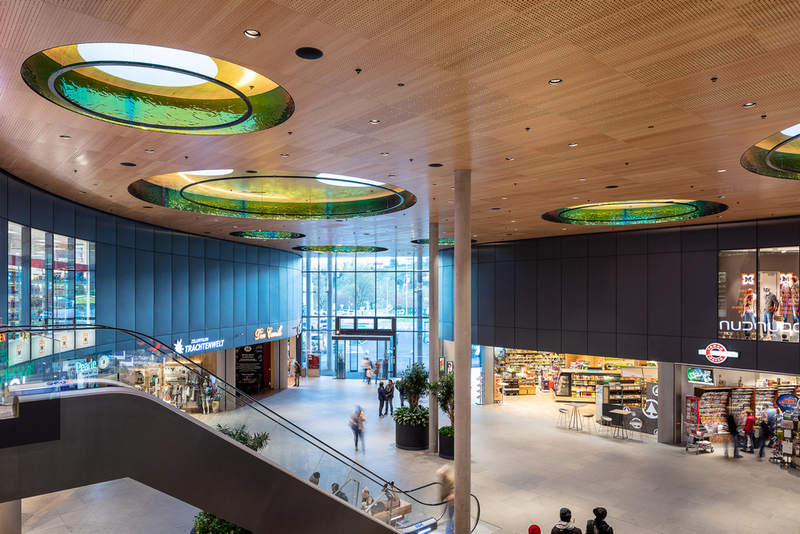 Nevertheless, the owners has decided to renovate it and thanks to BEHF Architects, the shopping mall WEZ has been upgraded into a modern-age facility designed to suit contemporary retail trends. WEZ comes with a novel look and an improved functional organisation. The room layout has been rearranged in such a way that it ensures the optimal use of space and an extended rentable area. 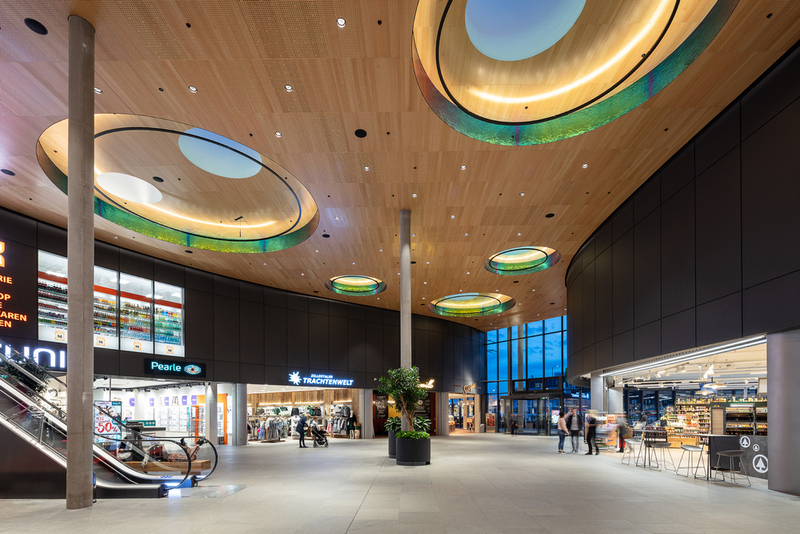 The dominant feature in the interior is a large atrium with circular roof lights which enables easy viewing of the stores and an efficient circulation. Round light funnels in the ceiling run along the entire atrium and bring daylight down to the ground. Lighting units also relate to the circle. Depending on the season and time of the day, one can easily change the atmosphere of the space playing with natural and artificial light. Uniform granite flooring and wooden panels on the ceiling play an important role in making the space warm and inviting. In order to achieve a balanced look and increase the visibility, the architects have developed a higher, representative entrance. Made of glass, it is also visible at night when the interior is illuminated and shines towards the exterior. The new facade made of black steel pays homage to the city of Bärnbach and its long tradition of coal mining. It extends in two gentle waves from the glazed entrance over the entire surface of the building. The outdoor space is generously enriched with parking spaces right in front of the mall. 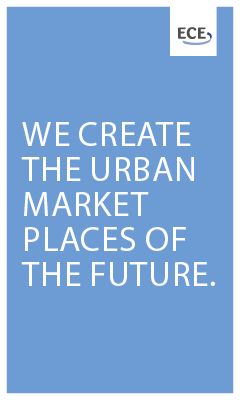 The design strategy ensures better traffic organsation and maximum convenience for the customers. BEHF Architects has renovated the existing property with great enthusiasm. 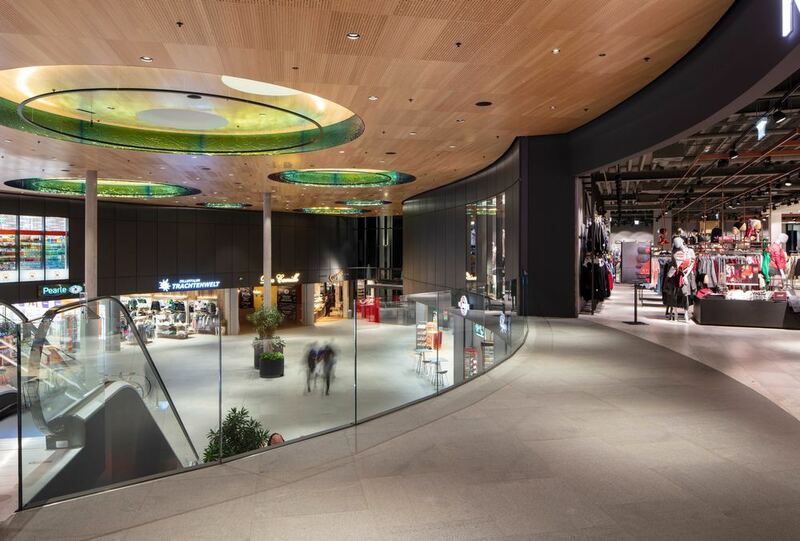 The intervention has resulted into a modern and inviting shopping place for the residents of Bärnbach.